Aliases: Pandemonium means "the abode of all demons"
Powers/Abilities: Pandemonium has a variety of magical powers. His body, composed of some form of ectoplasm, can spawn off any number of demonic creatures, though his own physical form deteriorates as he gives up more and more of it. His body is immune to most conventional forms of injury. He can alter his own appearance and apparently travel between dimensions. He carried a large sword. The opening in his abdomen is a portal to Hell that releases demons under his control. Pandemonium's body formerly contained an unknown number of demons known as the Rakasha. Presumably his body acts as a portal to these demons, though it is also possible that they physically exist within his body in a miniaturized form. His arms, which are actually the arms of four separate demons who normally exist within his body, possess superhuman strength (Class 10). When the demons are unleashed from his body, each regains their full form and has Class 10 strength. He can detach both arms, releasing the demons attached to them, leaving himself without any arms; he can reabsorb the demons and regain the limbs at will. Pandemonium also has knowledge of arcane demon lore and can perform certain rites of magic. 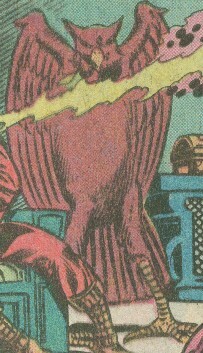 He can expel mystic flames from his mouth; these flames are capable of melting the outer layer of Iron Man's armor. He can project rays of magical concussive force from his hands, levitate, and perhaps other supernatural abilities as yet unrevealed. He formerly had a hole in his abdomen in the shape of an inverted five-pointed star. Pandemonium formerly held the Amulet of Azmodeus, which allowed him to perform interdimensional teleportation. The Amulet was also able to be used as a weapon against him, causing him pain and injury when it struck him. The Amulet also released Azmodeus, his avian familiar. Preston presumably had some talent as a movie actor. (Fantastic Four I#277 - BTS/Avengers West Coast# (fb) - BTS) - When Mephisto was temporarily destroyed by Franklin Richards, the demon lord found his soul split into six fragments. Rather than exhaust his own energies seeking out the fragments, he decided to dupe a pawn into seeking out the fragments for him. (Vision and Scarlet Witch II# - 12 / Avengers West Coast#52 (fb) - BTS) - Seeking to conceive a child with the android Vision, the Scarlet Witch managed to unwittingly latch onto the magic of two of Mephisto's fragments, using their energies to create twin sons, Thomas and William. (West Coast Avengers II#9 (fb) - BTS) - Martin Preston was an actor, working in movies for 27 years. He lived life in the fast lane. (West Coast Avengers II#9 (fb)) - While drinking and driving, Preston drove his car off of a canyon road. Though his seatbelt saved his life, he lost his left arm. Mephisto appeared before Preston, who offered his soul in exchange for his life and his. Mephisto claimed that he had enough souls already, but wished to make things interesting, and so he replaced Preston's arm with a demon's. Mephisto then replaced Preston's other limbs with demons. (West Coast Avengers II#15 (fb)) - Preston woke up in his mansion, apparently normal, thinking he had dreamed the whole thing. However, he then discovered a star-shaped hole in his abdomen. Mephisto then appeared again, telling Preston that he had taken his soul and split it up amongst five demons in different places, and that he must now use his powers to locate the soul fragments. (West Coast Avengers II#15 (fb) - BTS) - Desperate to regain his soul, Preston stole to finance his endeavors, killed to make men and monsters talk, and continued his search for "the Five." (West Coast Avengers II#9 (fb) - BTS / Official Handbook of the Marvel Universe, Deluxe Edition: Master Pandemonium) - Preston purchased the Anvil Pictures movie studio where he once worked. (West Coast Avengers II#6 - BTS) - Master Pandemonium encountered the Cat People at some point in the past, parting as enemies. (West Coast Avengers II#14 - BTS) - Master Pandemonium encountered the demon Allatou at some point in the past, parting as enemies. (West Coast Avengers II#4 (fb)) - Master Pandemonium investigated the magical energies associated with Firebird, hoping that she might be one of "the Five." She fought back against he and Azmodeus, but Pandemonium's arm-demons overpowered her and cast her down to Earth. (West Coast Avengers II#4) - Firebird was rescued by the West Coast Avengers and the Thing. Questioning whether the Thing was one of "the Five," Master Pandemonium attacked him, leading to a struggle with the West Coast Avengers. Master Pandemonium unleashed the Rakasha against them, but after an even struggle he decided that they were not associated with the Five, and he fled with Azmodeus. (West Coast Avengers II#6 - BTS) - Gerark, king of the Cat People, offered to help Tigra (with the problems she was having with the cat soul struggling with her human soul) if she would prove her loyalty to the Cat People by killing Master Pandemonium. (West Coast Avengers II#8/9 (fb) - BTS) - Pandemonium made an alliance with the demon Riglevio to defeat the West Coast Avengers. 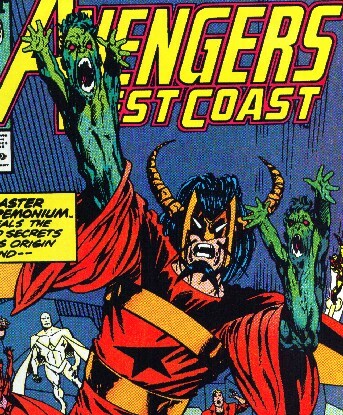 (West Coast Avengers II#8) - Riglevio, who was possessing the form of Shooting Star, manipulated the Rangers into a struggle against the West Coast Avengers. With the aid of Firebird, Riglevio's true nature was exposed, and the demon was forced to reveal its alliance to Pandemonium. (West Coast Avengers II#9) - Mockingbird impersonated Shooting Star, pretended to be Riglevio, and met up with Pandemonium. After learning his origins, Mockingbird attacked Pandemonium, using his Amulet of Azmodeus against him; at the same time, the Avengers, following Mockingbird, invaded his base and fought against his Rakasha. However, Tigra, seeking to kill Pandemonium, ambushed Mockingbird and knocked her out, but Pandemonium managed to reclaim his Amulet and escape. (West Coast Avengers II#14) - Azmodeus led Pandemonium to a struggle between the Avengers and Allatou, whom they suspected might be one of "the Five." The Avengers fought Pandemonium as well, but Allatou abducted Henry Pym and Greer Nelson and vanished, taking her demons with her. Pandemonium and the Avengers (joined by Hellcat and Hellstorm) followed Allatou to her realm of Hell, but she managed to trap them all on a ship floating down the River of Death. (West Coast Avengers II#15) - The River of Death led them all into the Land Within, home of the Cat People, who, in their own realm, out numbered and overpowered Pandemonium and the Rakasha. However, when Tigra refused to slay Pandemonium, a fight erupted between the Cat People and the Avengers, and Pandemonium used the distraction to reclaim the Rakasha and to shatter one of Gerark's urns, which released one of his soul fragments. Restoring one of the point on the star in his abdomen, Pandemonium the leapt into the River of Death and vanished. (Fantastic Four I#315 (fb) - BTS) - Continuing down the River of Death, Pandemonium accessed an interdimensional portal which transported him to Arcturus IV. 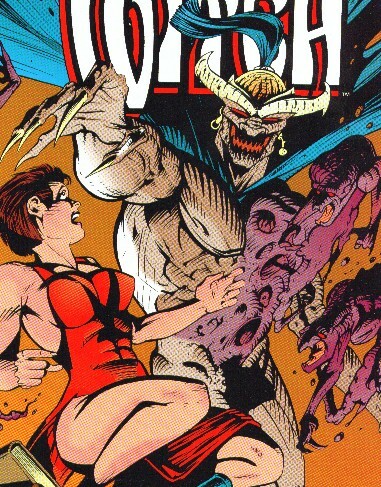 Pandemonium encountered the mutates of Arcturus and also found a tablet left by Morbius that detailed his adventures on Arcturus and his eventual escape. (Fantastic Four I#314) - Pandemonium encountered the Fantastic Four when they arrived on Arcturus IV via the same route. (Fantastic Four I#315) - After a battle, Pandemonium convinced the Fantastic Four to form an alliance to return to Earth. However, they lacked any means to do so until they were discovered by Max and the Comet Man. Max activated a space warp that transported the entire group to the Savage Land on Earth. (Fantastic Four I#316) - Master Pandemonium parted ways with the group. (West Coast Avengers II#50 (fb) - BTS) - Pandemonium was trapped for a time in the realm of Mephisto's Hell. (West Coast Avengers II#50) - Pandemonium discovered the connection of Thomas and William, the children of the Vision and Scarlet Witch, to "the Five." He plotted the means to make them his. (West Coast Avengers II#51) - The Rakasha assaulted Avengers Compound, battling the Avengers and providing a distraction while Pandemonium abducted Thomas and William, attaching each one to one of his arms, restoring two more of his soul fragments. (West Coast Avengers II#52) - Agatha Harkness located the two remaining soul fragments and sent the android Human Torch to bring them to Pandemonium. However, as soon as he had added the two final fragments, the remaining hole at the center of the former star became a magical vortex that pulled him into it. The five fragments were then restored to Mephisto. Agatha Harkness and Mephisto explained what had happened to the others, while Thomas and William were no more. (Scarlet Witch#3 (fb)) - Pandemonium was pulled back into Mephisto's realm, where he suffered unimaginable torment by the Rakasha. He was transformed into a more hideous form, but was eventually freed by and became affiliated with the mad nexus-being Lore. He made a new base within an arcane library in the New England village of Unity. (Scarlet Witch#1) - Pandemonium, believing that the connection to her former children made a bond between the two, sought a relationship with the Scarlet Witch. He sent an army of demons to Avengers Compound to capture her, but she and the Avengers fought them off. Agatha Harkness directed Wanda to travel to a library in Unity to investigate her status as a nexus-being. Wanda arrived there, only to be confronted by Pandemonium himself. (Scarlet Witch#2) - As Wanda fought Pandemonium, Lore traveled to Avengers Compound and captured the members one by one. Wanda managed to stun him several times, but he and his demon hordes continued to pursue her, eventually joined by demon-like golem forms of the Avengers. (Scarlet Witch#3) - With the aid of the Avengers golems, Pandemonium captured the Scarlet Witch, but Agatha Harkness arrived, freed Wanda, and the two of them trapped Pandemonium within mystic bonds. Lore then revealed her presence and her intent. (Scarlet Witch#4) - Pandemonium was freed during the struggle between the Scarlet Witch and Lore. He grabbed Wanda and held her for Lore, who tried to sacrifice both of them. Pandemonium was physically and emotionally wounded by the assault and betrayal, but Lore then fired a blast that seemingly obliterated him. (Deadpool III#68) - Master Pandemonium, back in his original garb and appearance, was present at a bar while Deadpool and the Taskmaster discussed an assault against the Black Swan. (Young Avengers Presents#3 (fb) - BTS) - Still feeling guilty about what he had done to the Scarlet Witch as a pawn of Mephisto, Master Pandemonium went into hiding in a house in Cresskill, New Jersey. (Young Avengers Presents#3) - Master Pandemonium watched from a window in his Cresskill home the arrival of Young Avengers members Speed and Wiccan, who were searching for their supposed mother the Scarlet Witch. Speed couldn't wait and entered the house first and was immediately transferred to a hell-like dimension. Wiccan entered second and got into a fight with Master Pandemonium, who sent the Rakasha against Wiccan. During Wiccan's struggle Master Pandemonium recognized Wiccan's magic as the Scarlet Witch's magic and after learning from Wiccan that his brother was his twin brother, Master Pandemonium let him go. With the knowledge that the Scarlet Witch's twins still existed Master Pandemonium brought Speed together with Wiccan back to his house and then told them his history with them and how he still felt guilty about what he did to Wanda. The heroes soon left him again and Master Pandemonium once again had the time to remember his time as an actor by watching old movies. (Dark Reign Files) - Quasimodo researched Master Pandemonium for Norman Osborn. (Ghost Rider: Heavens on Fire#2 (fb) - BTS) - Ketch sold his soul to "Satan" and arranged to save his son, the Anti-Christ/Kid Blackheart/Anton Satan, to regain his Ghost Rider powers and to learn how to access Heaven to confront Zadkiel. (Ghost Rider: Heavens on Fire#4 (fb) - BTS) - Caretaker joined Daimon Hellstrom & Jaine Cutter in delivering the Anti-Christ to a portal to Hell. (Ghost Rider: Heavens on Fire#4) - Splitting up to try to more easily locate the portal to Hell in Jasper County, Caretaker and the Anti-Christ entered a deconsecrated church where they found the portal, Master Pandemonium, who punched Caretaker unconscious. (Ghost Rider: Heavens on Fire#5) - Per the Anti-Christ's orders, Master Pandemonium opened his portal to Hell and began releasing a bunch of demons. The Anti-Christ then spoke a certain word that caused Caretaker to open a portal to Heaven through her. As Hellstorm and Jaine arrived, the Anti-Christ passed through Caretaker's portal with the demons, after which Caretaker forcibly slammed the portal shut and vanished. (Ghost Rider: Heavens on Fire#6 (fb) - BTS) - Daimon and Jaine knocked out Master Pandemonium and slaughtered the demons. (Ghost Rider: Heavens on Fire#6) - Master Pandemonium lay unconscious as Daimon and Jaine made out. Sometime later, Master Pandemonium accompanied Blackout and "Kid Blackheart" to a strip bar. Kid Blackheart promised, "One more song and then we'll start...you know, conquering the world for Satan or whatever." 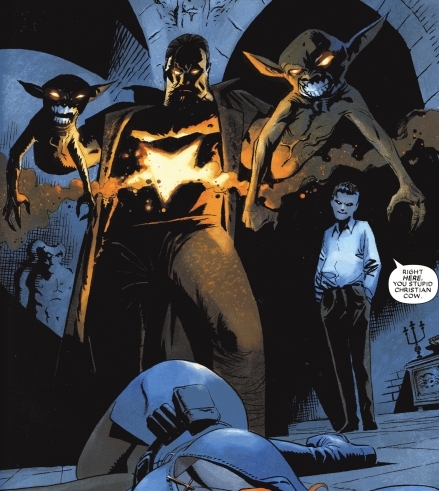 (Fear Itself: The Fearless#8) - Master Pandemonium joined the DOA under Sin's leadership. (Fear Itself: The Fearless#10) - Master Pandemonium joined the DOA's battle against the Avengers and other heroes at the DOA's HQ in South Carolina. (Fear Itself: The Fearless#12) - Master Pandemonium was affected by the Final Sleeper's fear wave during the battle in Charleston. (Venom II#42 (fb) - BTS) - Pandemonium took in disciples like Master Mayhem as part of his Entropy Cell. Comments: Created by Steve Englehart, Al Milgrom, and Joe Sinnott. Don't know what Englehart intended for Master Pandemonium, but I'm willing to bet it wasn't what Byrne came up with. OK, for my money, I'd say that Azmodeus the familiar of Master Pandemonium is indeed the same character as the demon from Hell AND the father of the Lilin listed below. Certainly Asmodeus is a popular name and many demons might try to hawk it, just like "Satan," but there's nothing to exclude it, either. I'd like to paint Asmodeus (@ Ghost Rider II#53) as just as old as Mephisto, but just having fallen out of power, etc., in more recent years. He totally could have mated with Lilin back in his prime. Then, after being seemingly destroyed by Mephisto in Ghost Rider II#76, he could have instead been transformed into a much weaker form and forced to serve other, as punishment former his former rival. In the Young Avengers Presents story the writer made a small mistake. Scarlet Witch and Vision lived in Leonia, New Jerey and not in Cresskill. Wiccan's faulty memory led them to Master Pandemonium, who had some history with Wanda's twins too. A bird-like familiar to Master Pandemonium, it is unclear whether it is one of the Rakasha or whether it has other origins altogether (see comments). It typically dwelled within the Amulet of Azmodeus, coming out to advise (or taunt) Pandemonium, often notifying him of magical or demonic activity that might have been linked to "the Five." It was presumably sent by Mephisto to help guide Pandemonium to recover the soul fragments. A dangerous opponent in its own right, it was a human-size bird with over-long legs, and talons capable of scratching even the Thing's tough skin. It could fly carry a fully grown man, and may have had other powers as well. It typically spoke in an out-of-order fashion, "Don't laugh make me!" It has also been known to smoke a cigar or two. A group of demons from Mephisto's realm, they were released on Earth to do the bidding of Master Pandemonium. After Pandemonium obtained the last of the five soul fragments, he was sent to Hell, where the Rakasha were allowed to torture him. The Rakasha had a variety of forms and abilities, often dependent on their form, but most had superhuman strength and durability. One proved able to touch the Vision even when he was intangible. It is unclear whether Azmodeus and/or Riglevio are Rakasha.